Much is written about the lottery, particularly when the jackpot reaches a record - typically near the $1 Billion mark. Sadly, many people continually play the lottery in the hopes of being "the one". It turns out, there is a much more reliable path to riches that pretty much only requires patience. The history of lotteries dates back to between 205 and 187 B.C. in China where a form of a lottery was believed to have financed - of all things - the Great Wall of China. Augustus Caesar employed a similar mechanism to finance repairs in Rome. France and England followed suit and eventually the beloved lottery found its way to what is now our United States when King James I granted the Virginia Company of London the right to conduct lotteries to finance settlers to come to Jamestown, Virginia. The lottery was a major financing mechanism of the colonies growth and even the Universities at Princeton, Columbia, and Pennsylvania (yep, the Ivy League types) got in on the action. Today in the United States, MegaMillions and PowerBall rule the lottery landscape with jackpots reaching ever-higher numbers. And now, in Ohio, technology has come to the lottery as individuals are able to play the lottery from a smartphone...King James I would be so proud. Depending on what you read, the media takes a different stance. 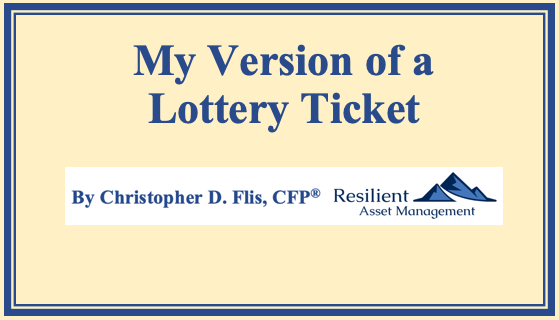 In my readings, which typically center around financial-related content, the offerings focus on the "Lump Sum" vs. "Annuity" Option, the Income Tax implications, and the Checklist of "Things to Do" when you win the jackpot. Ironically, these articles are only applicable to a minuscule subset of all the lottery players, so one would wonder why any of this content is even published. The simple answer is practically never...see below for more details. Somewhat paradoxically, your chances of dying in a car crash on the way to purchase your lottery ticket exceed your chances of winning - if you're driving more than 1 mile to buy your ticket. So, I suppose, don't complicate matters and at least walk to the store to buy your ticket. Without getting into some pretty detailed math (it is not complicated), suffice it to say there are jackpots large enough to where it makes sense mathematically to play the lottery. The calculations revolve around the probability equation of expected value. For those interested, there is a great explanation of MegaMillions math here. Not to spoil the surprise, the jackpot amount where your $2 lottery ticket begins to approach a $2 expected value is about $2.6 Billion. To date, the largest jackpot has been $1.586 Billion. Thus, using the expected value logic, you should have never played the lottery to this point. For one reason or another, people remember certain times and places in their lives. For example, I remember I was in science class at Holy Souls School in Little Rock, AR in 1986 when I learned of the Challenger Space Shuttle disaster. There are other tragedies I won't mention. Included in this list, however, are some happy memories! In the Summer of 1995 when I was a newly minted United States Navy Ensign. I was relaxing after a busy Commissioning Week and took in a talk show (Maury Povich if you must know) related to investing. Among the guests on this particular show was Peter Lynch, the Investing Titan responsible for the spectacular management of Fidelity's Magellan Fund from the late 1970s to the early 1990s. Believe it or not, I can still see the video in my head today of his answer to a very direct question..."Peter, if you could only invest in one company, which one would it be?" I will never forget his answer - "Johnson & Johnson". There were no caveats, exceptions, declarative sentences, or even much of a pause. 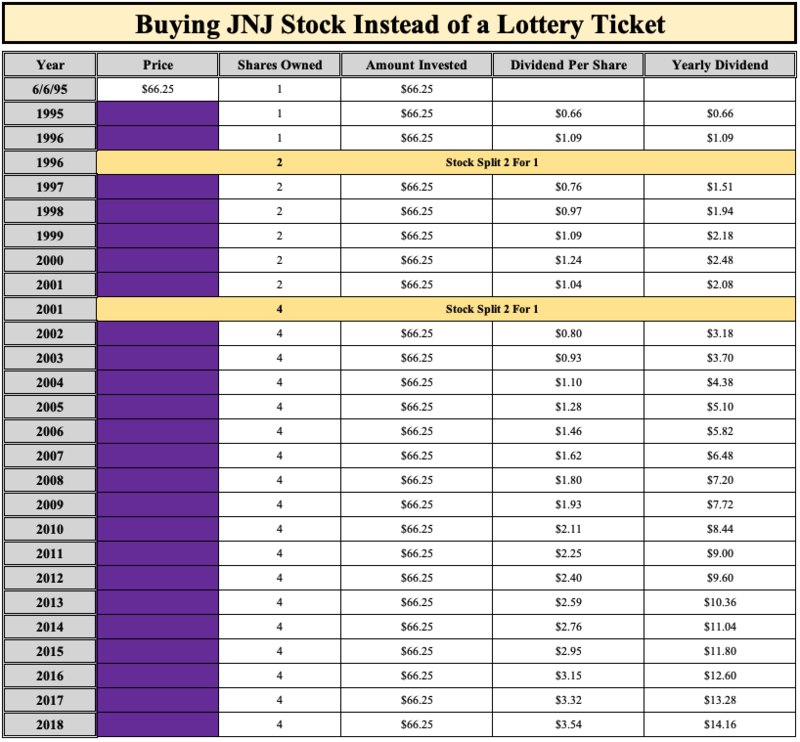 Compared to a Lottery Ticket, which we already know is negative for all but the most unusual of jackpots, ownership of JNJ stock was and is a far superior investment. This assumes, of course, that one views playing the lottery as some sort of an investment. And I don't think a tremendous amount of insight was required in the Summer of 1995...I was a 21 year-old college graduate who thought I knew about 10 times as much as I actually knew - the number is modestly less than 10 now. All I did was listen to the TV and then go hit the buy button - not unlike what some people do with the lottery. With JNJ stock however, my modest behavior produced somewhat immodest results. While it is probably good general advice to be patient in all endeavors, in few ventures is it more profitable to be patient than in investing. Seemingly, for as busy as some people are, one would think buying and forgetting would be a snap. Sadly, it isn't and the proofs keep stacking up. If you read this, you will find that just last year, when the S&P 500 lost a mere 4.82%, the average investor lost 9.42% - or roughly double the market average - not good. This difference can only be explained by inopportune buying and selling. Thus, if you find yourself being influenced by market pundits, prognosticators, savants, or anyone else purporting to tell you where the market is going, for your own financial good, ignore them. Rather, average yourself into the market over time and get your fair share of returns from the market. In school, we all learned not to look on our neighbor's paper...that's cheating. With investing, there is no penalty for copying nor is there a penalty for inactivity. To be sure, there are many people who run around displaying their "answers" to everyone. Some of these pundits are pure entertainment spewing truly awful advice. Others, fortunately, are worth listening to. In the example above, Peter Lynch is one person for whom I would turn the volume up on the television. And there is no penalty for following him into a particular stock and profiting. For the heavyweights, they are required to disclose what they own, so learning the contents of their portfolios is an open book. No endeavor is perfect. Take our JNJ example above...JNJ is in the headlines right now for potential liability related to the contents of their baby powder product. Just a few years ago, the had contamination issues related to Tylenol and other over-the-counter medications. And even further back in 1982, JNJ was embroiled in a cyanide scandal related to their Tylenol product as well. Despite these setbacks, the JNJ brand is still a heavyweight amongst health care companies. With other commitments - pick your favorite start-up or crypto-currency - the potential for greatness is high, though the longevity of something like JNJ is much less so. So stick with commitments that have both staying power and are able to endure setbacks, because they will happen sooner or later to the best of organizations. Inexplicably, according to this article, a full one-third of people believe it will be more likely they will learn Chewbacca (yes, Han Solo's friend) is real than retiring comfortably. Perhaps Chewy is real; however, I have more faith in the efficacy of the stock market. You don't have to do much early on to set yourself on a path to prosperity. In our lifetimes, it has never been easier or cheaper to get started. And once you start, you don't have to do much to the portfolio - it will work for you day and night and never tire. No matter how hard anyone tries, human gestation is still about 9 months, give or take some months for our exceptional children. Similarly, most people don't become millionaires in one year, or even several years. It takes time and patience. I see many people try to short-circuit this process through well intentioned endeavors such as side-gigs or dubious investments. While their hearts are in the right place, these emotional commitments typically end up poorly. So the next time you're presented with such an opportunity and are considering deploying capital (money) to something, ask yourself, "Is this going to do better than the S&P 500 over the next 30 years?" Almost invariably, the answer is no. If it is, don't set yourself further behind by throwing money at a losing proposition. Instead, start a regimented saving plan with equities as the backbone of your portfolio. I don't wish to deny anyone the enjoyment of the lottery. I have a personal policy of buying one lottery ticket when the jackpot is over $1 Billion. I followed this policy the first time we had a $1 Billion jackpot and ran afoul the second time. For what really counts - my annual savings contributions - I have perfect attendance and I intend to keep it that way. You simply cannot match the effect compound growth has on your net worth - the effects are simply tremendous. Anyone who disagrees is free to call me at (901) 318-3423. I encourage you to either ride the wave along side me or start to avail yourself of the effects by starting an investing policy modeled on the JNJ example I laid out above. Comments, criticism, and suggestions are always welcome. If you would like to provide any or would like to discuss your personal situation with Resilient Asset Management, please contact us here. Check the background of this firm/advisor on FINRA’s BrokerCheck.